Nestled deep within the shops that line Lower Greenville sits Nora Restaurant and Bar, a cozy, unassuming spot serving up Afghan cuisine and killer views of Downtown Dallas from their rooftop patio. Since opening in 2012, Nora has quickly become a date-night favorite for foodies in the know. With minimalistic decor and low lighting, it is clear that Nora’s focus is to provide an elegant and upscale dining experience for its patrons. Sure, you may have never heard of half of the menu items before but the staff does an excellent job at describing each dish in detail and guiding you in the right direction based on any preferences you have. The cocktails are well thought out and stick to classic creations that everyone can enjoy and appreciate. According to my waiter, the most popular cocktail here is the Nora 75 which consists of gin, lemon juice, hibiscus cordial, simple syrup and champagne – and yes, it is as refreshingly fantastic as it sounds! As for the food..oh, the food! 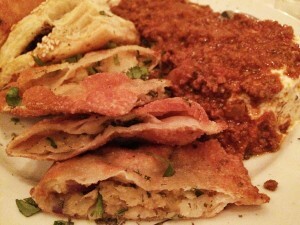 The portions are the perfect size, presented piping hot with just the right amount of flavor as to not be overwhelming. I began with the the Sampler off the Small Plates menu which offered appropriate portions of Nora’s Kadu (sautéed pumpkin with garlic yogurt and meat sauce), Sambosa Goshti (lightly fried pastries stuffed with ground beef chickpeas and green peas), Bulanee (potato pastries with mint sauce) and Aushak (steamed leek dumplings topped with the same mint yogurt and meat sauce that you’ll find on the Kadu). Each tasting was delicious in its own right and it is hard to single out a favorite. 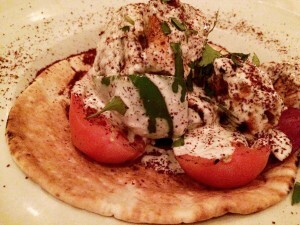 The Chicken with Yogurt that I enjoyed for my entree consisted of medallions of chicken and fresh vegetables, grilled to absolute perfection topped with yogurt sauce, herbs and spices and served on a warm pita bread round. Light but somehow filling at the same time, this dish would be perfect to enjoy on a sultry Dallas summer evening. 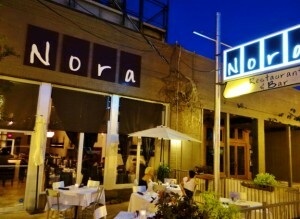 Whether it is a romantic night on the town, cocktails with friends on their rooftop, a business dinner or you are just in the mood for some fabulous food, Nora is an exceptional place to go.